He finally did it! Andy Bloch has been playing at the World Series of Poker for more than a quarter of a century, and after reaching nine WSOP final tables and finishing runner-up twice, he is finally the owner of a shiny gold bracelet. The day began with David Williams in the lead and three players with less than six big bets. Joseph Ranciato, Scott Abrams and Caroline Hermesh exited quickly, while Huu Vinh — who started the day with just two big bets — battled back into contention. Vinh won a very large pot during the first level of play where he got four streets of value off of two players, which allowed him to sit back and climb the money ladder. Lee Goldman was the next victim. He made a pair of queens on fifth, but Williams had made two pair on fifth, and grabbed the lead. Williams was dealt a third five on sixth street, giving him a full house and Goldman bricked. At that point, Williams had a commanding chip lead, and it was almost his tournament to lose. He made a full house against Bloch a few hands later and reached his peak chip count of 650,000. Williams started to slip however, and a level after taking a commanding chip lead, he only had 191,000 chips. Vinh, who had been treading water since Goldman’s elimination, eventually bowed out with three pair against Bloch’s aces up and Williams, who tried to make a comeback, fell short as well. 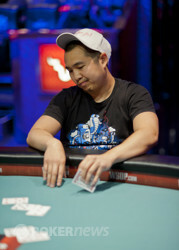 Stephen Su sent him to the rail, and it was his turn to take the chip lead. Su, Greenstein and Bloch traded pots for the better part of two levels, until Bloch put the pedal to the metal. The former MIT black jack player soared to over 900,000 chips and eliminated Su. Su was ahead in his final hand with a pair of sevens on fifth street, but Bloch pulled a second ten, making a pair of tens and held. Bloch entered heads-up play with nearly a four-to-one chip lead and eventually extended it to ten-to-one. On the final hand, Bloch had buried queens and made queens and tens on fifth street. Greenstein had made an eight-high straight, though, and was in prime position to double up. The on sixth and the on seventh gave Bloch Broadway, however, and he was finally a champion. 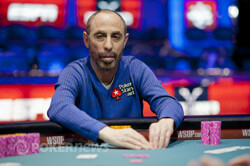 The next time you’re making a list of great players who have yet to win a bracelet, make sure you omit Mr. Andy Bloch. It took him more than 26 years, but today’s win was better late than never. 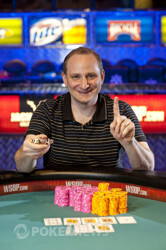 Andy Bloch dominated the table on his way to victory and his first WSOP Gold Bracelet. When you're playing solid and running well there's often no match for you at the poker table. That was the story in Andy Bloch's case as he put on an extremely solid performance in this event and there wasn't much Barry Greenstein could do about it, especially after losing the recent big hand. The final hand began with Greenstein bringing in and Bloch completing. Greenstein called and then called Bloch's bet on fourth street. On fifth street, all of the money went in as the two bet and raised back and forth. Greenstein turned over an eight-high straight and Bloch two pair with queens and tens. Bloch picked up the on sixth street to give him a gutshot to Broadway and some more outs. Greenstein just needed to dodge a king, queen or a ten to stay alive and double up. Bloch turned over his seventh street card and revealed the to give himself Broadway. 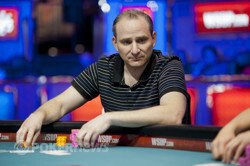 Now drawing dead, Greenstein's last card was the and he was eliminated in second place. Greenstein earned $78,038 for his runner-up finish while Bloch has lifted King Kong off his back. Barry Greenstein brought it in with the . Andy Bloch raised with the , Greenstein re-raised, and Bloch called. Both players checked on fourth street, and Bloch led out on fifth when he paired. Greenstein raised, and Bloch tank-called. On sixth street, Bloch checked, and Greenstein quickly bet. Bloch tanked for over 30 seconds before check-raising, and Greenstein called. Bloch opted to lead once again on seventh, and Greenstein tanked for well over a minute before finally folding. Bloch is now over 1.5 million chips, while Greenstein has only 140,000. Stephen Su - 3rd Place. After making quads on fifth street in a previous hand, Andy Bloch completed with the . Stephen Su raised with the , and Barry Greenstein, who brought it in with the , folded. Bloch called. Bloch check-called a bet on fourth street, and then led out on fifth. Su raised, putting himself all in, and Bloch called. Both players were dealt a ten on sixth street, and Bloch's pair of tens gave him the lead. Seventh street was dealt face-down, and Bloch immediately turned over the . Su needed a jack, seven, three, four, or ten to survive, but the was no help. Su receives $50,332 for his third-place finish, while Bloch is now heads up, looking for his first WSOP bracelet. Andy Bloch just scooped a pot to move over 900,000 in chips. He won the hand off of Stephen Su, who dipped back to 335,000. Bloch bet the whole way as his board ran out / . Su stayed with him, but folded on sixth street after Bloch paired with kings. Su's board was / . 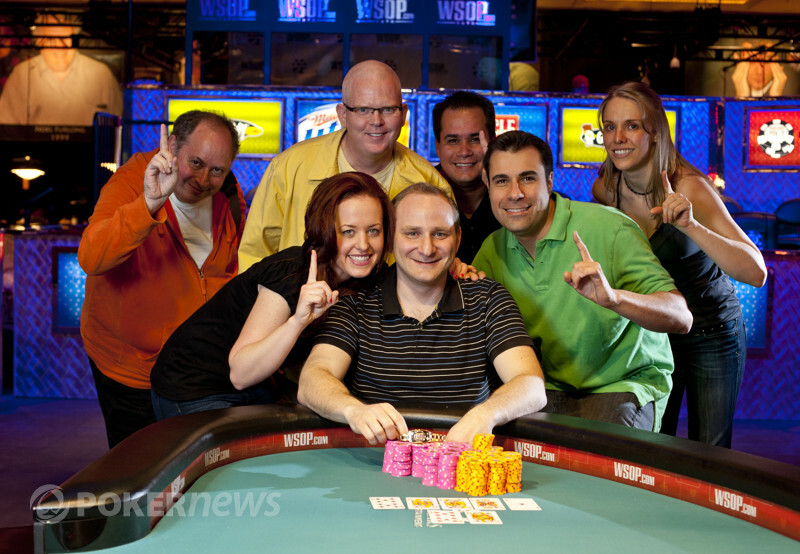 Andy Bloch and friends celebrate his bracelet win in Event 7. Andy Bloch is the bracelet winner of Event 7.